Every time it crosses my mind that there’s going to be a new Indiana Jones movie, I get a big goofy grin and my brain starts playing the theme song. I played Indiana Jones a lot as a kid. I remember how my dad combined an old piece of rope and some black electrical tape to make me a whip, and how my mom cut a whole bunch of holes in an old shirt so I’d look (or at least feel) like I’d just escaped from the Temple of Doom. On May 22, this 32-year-old boy plans to reward his parents for their love and support by taking them to see Indiana Jones and the Kingdom of the Crystal Skull. Producer Frank Marshall, whose credits you’ve got to see to believe, recently spoke to USA Today and revealed some interesting (and very exciting) bits and pieces. When last we saw Indy, he was riding off into the sunset in 1989’s The Last Crusade, set in 1938 near the start of World War II. The new movie, due this spring, is set at the height of the Cold War in 1957, so the character has aged in real time — 19 years. “He’s teaching and having kind of a quiet life,” the producer says. Once the archaeologist is thrust back into danger, the signature Indiana Jones red line tracing across the map will take him to New Mexico, Connecticut, Mexico City and the jungles of Peru. The Nazis are no longer Indy’s chief foe — he’s racing for the Crystal Skull against operatives from the Soviet Union, including Oscar winner Cate Blanchett as the seductive Agent Spalko. “Indy always has a love-hate relationship with every woman he ever comes in contact with,” Marshall says. Cate Blanchett as a hot villain? Delicious. The artifact of the title is inspired by real quartz sculptures of disputed origins that are carved in a way that defies the natural structure of the crystal. “The theory is they are shaped by higher powers or alien powers or came from another world, or an ancient Mayan civilization had the powers,” Marshall says. This is going to be so awesome. 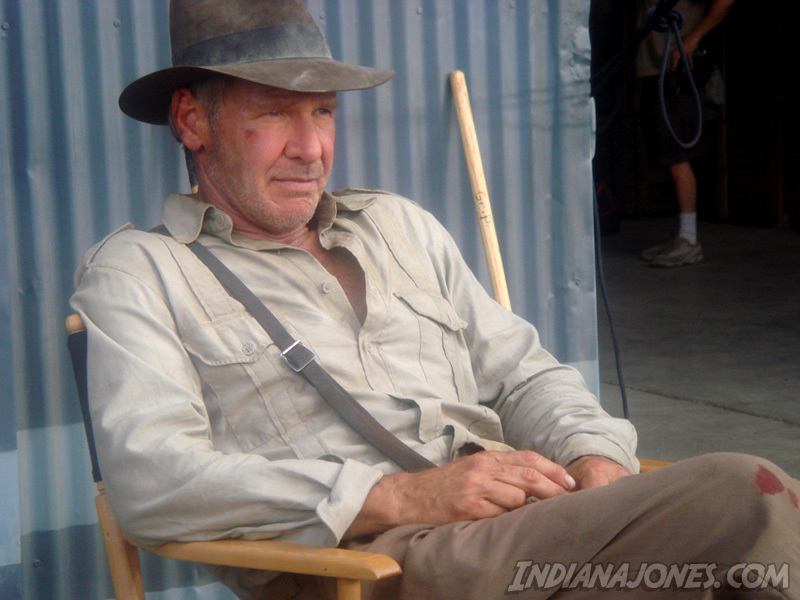 Harrison Ford returns as Indiana Jones. Keep your eyes on the official site for news, photos and exclusive video!